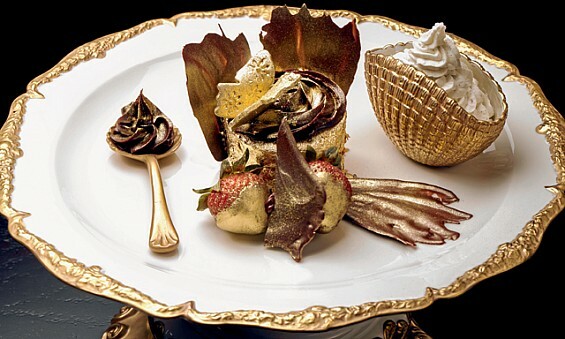 It’s a gold-infused cupcake made with Italian cocoa, Ugandan vanilla beans, organic strawberries, edible gold dusting, and comes wrapped in an edible 23-carat gold sheet. And at AU$1,157 apiece, this outlandishly decadent cupcake created by Bloomsbury’s Cupcakes is yet another symbol of a city that over the past 15 years has become a glutton for excess. From the world’s tallest building – the Burj Khalifa – to the world’s biggest airport, one thing is clear: Dubai rarely settles for second best. Only fifteen of the ‘Golden Phoenix’ cupcakes have sold since they first hit the market in 2013, with almost all of the orders placed by the palaces of the UAE’s ruling sheiks. While this type of decadence might seem over the top, especially when one thinks of the more than 2.5 billion people worldwide who survive on less than US$2 a day, the creators of the world’s most expensive cupcake actually have their hearts in the right place. Dubai’s Bloomsbury’s Cupcakes store has decided to donate 50 per cent of the cupcake’s profit to the United Nation’s World Food Programme (WFP). Ashraf Hamouda, Head of Partnership & Business Development for MENA, Central Asia & Eastern Europe at the United Nations World Food Programme, pointed out that the cost of a single ‘Golden Phoenix’ cupcake could feed at least 1,850 malnourished children.